As of April 21, 2019 there are ACTIVE residences for sale in Casa Del Sol with an average list price of $. The most expensive ACTIVE property listing is $, while the least expensive property can be purchased for $. Homes in Casa Del Sol have an average price of $ per square foot, based on listings with an average of bedrooms, bathrooms, and square feet of living space. 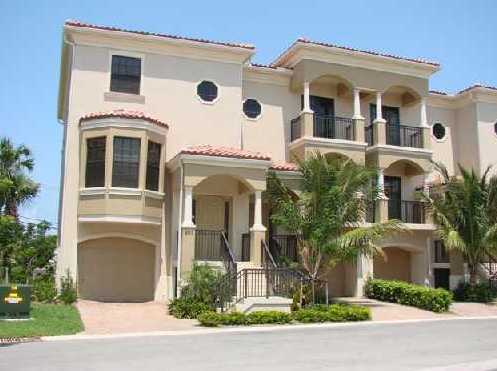 Search Casa Del Sol townhomes for sale in Tequesta, Florida below. Townhouse style homes are popular for many reasons. First and foremost, having one’s own space is just about always preferable to living in a duplex, or other multi-family building. Private access, basements, rooms and bathrooms all make a family feel like they really own a place – not just like they live there. Casa del Sol is a Tequesta neighborhood made up exclusively of these single family type properties. The community features a total of 41 residences, each containing three stories of living space. Construction was just recently finished in 2010, so the majority of these homes are still in like-new condition. Read more about Casa del Sol real estate. If you’ve never lived in a place with your own private elevator, Casa del Sol will surprise you. Private lifts in the majority of neighborhood homes means climbing flights of stairs after a hard day at work is no longer necessary. Older and injured people can also enjoy a home’s second or third floor without enduring a painful climb to get there. These homes come with either three or four big bedrooms depending on the building, plus multiple full baths, so there should never be any morning bathroom lines to deal with. Entry to the community is also guarded by a gate, which is a plus. Looking to sell or buy a townhome in Casa Del Sol? Call Snyder Real Estate Group, your neighborhood Tequesta real estate team at at (561) 951-9301. We are Casa Del Sol real estate agents and experts on the Casa del Sol Tequesta, FL housing market. As for meeting up with neighbors in the same community, there are a few places where Casa del Sol residents tend to gather with one another. There’s actually a single clubhouse set aside for meetings and such; it has a full service kitchen and seating for many. In addition, there is an on-site, heated community pool, as well as a spa for getting in some personal time whenever residents have time to spare. It’s a luxurious location with big homes, high-end security and a real sense of peace and quiet. That last point alone is worth paying a premium price every month, isn’t it? Considering the purchase or sale of real estate in Casa del Sol? Let our team of Tequesta real estate specialists professionally assist in your hunt for the perfect townhome and skillfully negotiate the sale of your existing Tequesta townhouse. As Casa del Sol neighborhood real estate agents, we know the unique nature of the Casa del Sol real estate market. Our real estate pros can get you on the fast-track to your next townhome today! Call Snyder Real Estate Group today to learn more about buyer or seller representation. Considering the sale of your Casa del Sol townhome? Receive a free townhome assessment, where you can instantly calculate your property's estimated market value in seconds!